A denture is a removable replacement for missing teeth and adjacent tissues. It is made of acrylic resin, sometimes in combination with various metals. 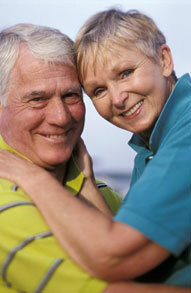 There's a wide variety of denture options available; Dr. Ralph T. Mazzuca, D.D.S. and his staff will help you choose which is best for you. The denture process takes about one month and five appointments: the initial diagnosis is made; an impression and a wax bite are made to determine vertical dimensions and proper jaw position; a "try-in" is placed to assure proper color, shape, and fit; and the patient`s final denture is placed, following any minor adjustments. Even with full dentures, you still need to take good care of your mouth. Every morning, brush your gums, tongue, and palate with a soft-bristled brush before you put in your dentures. This removes plaque and stimulates circulation in the mouth. Selecting a balanced diet for proper nutrition is also important for maintaining a healthy mouth.